Neoregelia 'Hot Wire' is a cultivar of (Hannibal Lecter x Cheers) by Michael Kiehl. The leaf color is light green with black spots and some bands, more darker on the lower outer parts. The leaf margins have black spines and tips are black. The small plant is stoloniferous, growing to 7 inches tall and 9 inches across. A good combination of both parents. Maximum Size: H:7" x W:9"
All plants are shipped bare root. What's this? Mature Plant or Offset - What's the difference? Mature plants are established plants with a root system, usuall full grown or almost full grown to their maximum capable size. 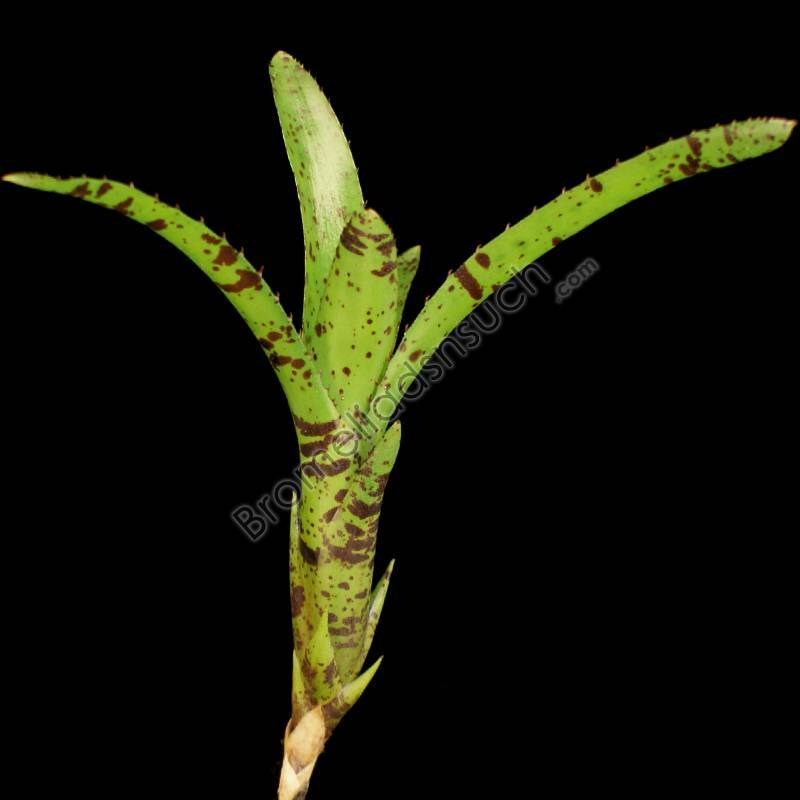 An offset is a shoot that develops at the base of the plant, rooting to form a new plant identical to its parent. Also called a "pup". Most offsets have less color than mature plants and may or may not have roots. An offset or cutting will also vary, depending on the variety of plant, but will always be ‘ready enough’ to be easily rooted and grown. 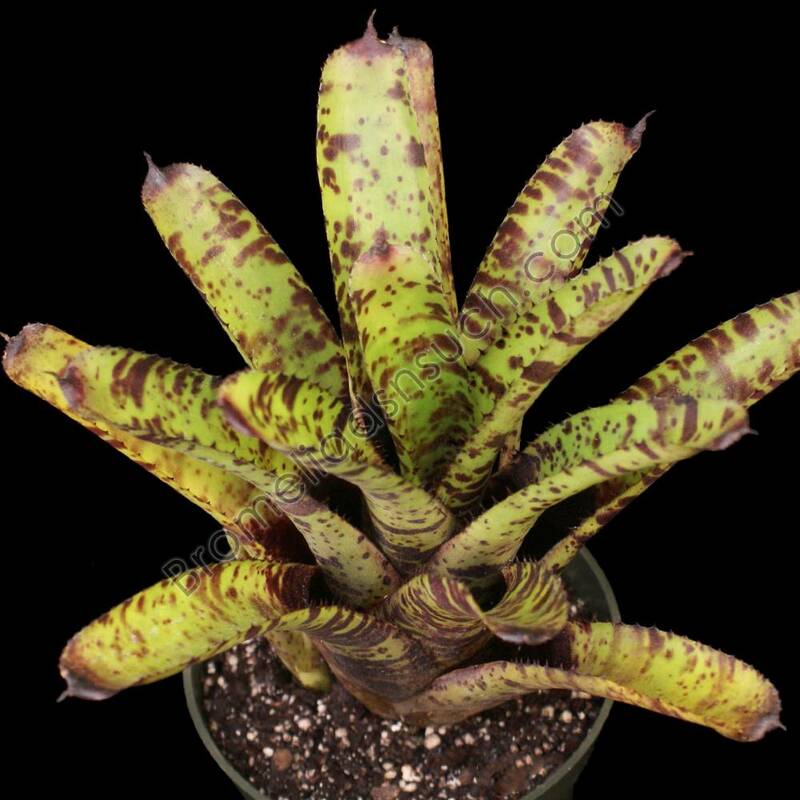 We follow the basic bromeliad rule for cutting pups which is cutting them off when they are at least half the size of the mother plant. Smaller stoloniferous offsets are good for terrariums. Since offsets cost less than a mature plant, they are recommended for those who want to grow them up to mature plants themselves. Learn more.